Home » »Unlabelled » When firemen found the nine-year-old, she was already dead. But under her body they found something heart wrenching. When firemen found the nine-year-old, she was already dead. But under her body they found something heart wrenching. On August 24th, Italy was hammered with a devastating earthquake in the town of Pescara del Tronto, which is 93 miles northeast of Rome. 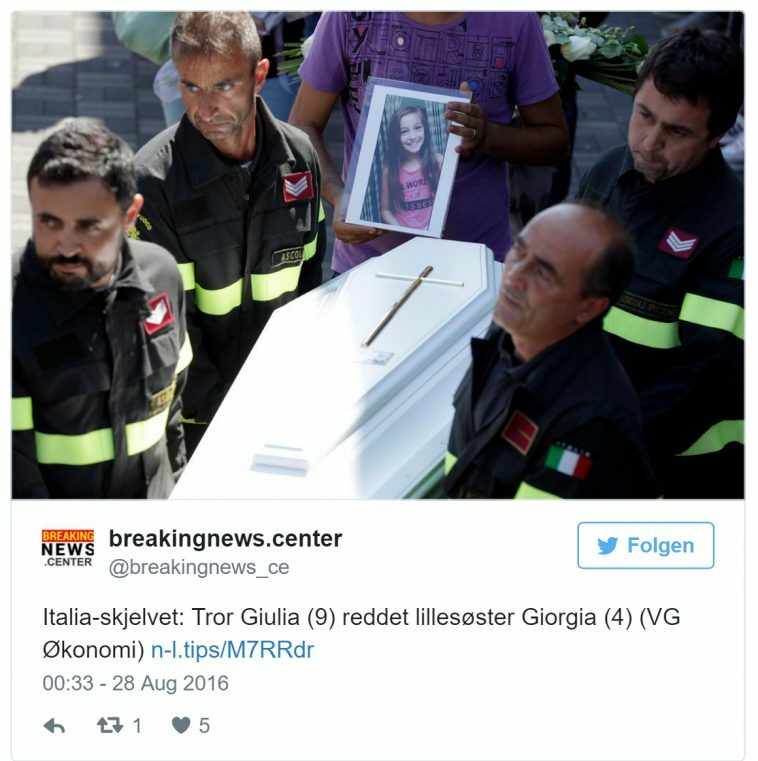 Giorgia Renaldo was only four-years-old and was buried under a huge mass of debris. Rescue workers were actively digging out the scene when they came across the young girl, who amazingly, was alive! But it turns out her nine-year-old sister Giulia, did not make it. It was Giulia who gave her own life, in order to save her sisters. They found her cradling her young sisters body, which in turn protected her from the quake. I only helped the others to try to get you out of that prison of rubble. I’m sorry if we arrived too late, you had already stopped breathing but I want you to know, from up there, that we did everything that was possible to save you. When I return to my home, in l’Aquila, I’ll know there is an angel watching over me from the sky and, during the night, you will be a shining star. Goodbye Giulia, even if you never met me, I love you. And here’s the video of when they made the discovery. Note that the rescue workers mix up the sisters names. A very moving letter that first appeared in newsprint, and has since been making heavy rounds on the internet. The fireman’s words made sure Giulia would never be forgotten as she made the ultimate sacrifice to save her sis. Share the fireman’s moving words with friends and family.